A set of 8 chalets with capacity for up to 5 people. Characteristic of each cottage: Full bathroom, mini kitchen with refrigerator, 2 burner stove - semi industrial (pressure) and kitchen utensils, each cottage has a right to a network. indoor play area (Kiosk) and swimming pool. Each chalet has an individual barbecue. We do not have room service, and do not serve breakfast and meals. 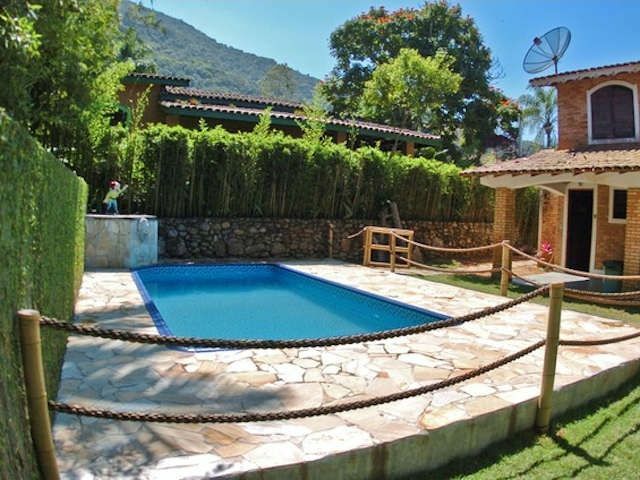 Location: Lagoinha Beach, Km 72.5, chalet located in the Condominium Samola, beside the Tropical Restaurant, 70m from the beach. Located in one of Fine Ubatuba Beach, the Beach Pond, calm waters and calm, clear, suitable for relaxing baths! Incredible waterfalls that invite a counted to Nature! Trails for the adventurous, with beaches to rest and admiration to the works that nature gives us! Meet the needs of visitors is paramount and for both our region is provided with markets, grocery, restaurants, pizzeria, ice cream shops, butchers, fishmongers and churches.